Giving you the best experience of Mallorca has always been the mantra at abcMallorca. And since founding the company over a decade and a half ago, Helen Cummins’ ambition has remained unwavering, driven by a passion to share with others all the hidden places, interesting people, vibrant culture and wonderful experiences that the island has to offer. Having reached the landmark of five-million unique users in 2018, the abcMallorca website is reaching more people than ever before and has established itself as the undisputed top Mallorca-related website in the world. The magazine continues to be the island’s benchmark publication for sharing all the latest openings, real life stories, hottest trends, glamourous events, and lots more. 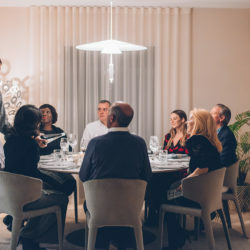 abcMallorca’s networking lunches are also more popular than ever, connecting both established and emerging business owners in some of the island’s finest restaurants. The pioneering abcMallorca Reservation app is becoming the way to book restaurants on the island. But there was something missing. Something to connect all these elements, a space where the world of abcMallorca could be experienced first-hand, a living hub in which to showcase the best of the island, where the contents of the magazine could be brought to life, with tastings and talks, workshops and events. A place to network, make new friends, share, laugh, learn, discover, and be inspired – somewhere foreigners and locals can get together, to grow closer and gain a better understanding of each other. The abcMallorca Experience Centre was born. Perfectly positioned in the heart of historic Palma, if you have a question, are looking for a recommendation, or want to share something with us – the door is open. You are invited to connect with the world of abcMallorca. “Our greatest legacy is knowing that we are responsible for so many successful business collaborations, memorable moments, and most importantly, lasting friendships,” affirms Helen.And with the new abcMallorca Experience Centre, she hopes to take this to the next level, to continue connecting people, continue sharing her love of the island, and continue giving you the very best experience of Mallorca.